This is the sermon I preached at St. Timothy Lutheran Church on 6/3/18. I had the privilege of confirming three young people in their faith. The scripture text was 1 Samuel 3:1-10. In the chapters that precede this lesson, we learn about a promise Samuel’s mother, Hannah, made to God. Unable to have children, Hannah vowed that if God gave her a male child, she would give him to the Lord. God answered that prayer and that’s how Samuel came to be with Eli as a surrogate son and apprentice. Even before Samuel knew God, God knew him before he was born. Allie, Lucy and Alex, God knew and loved each of you before you were born as well. Your parents too, brought you to God’s house to be baptized, dedicating you to God as you became part of the family of God. As a parent, I know the thrill of a child coming into the life of a family. I’m sure your folks were thrilled when you came into their lives. We’re told that Samuel did not yet know the Lord even though he lived in God’s house, had a relationship with the priest and was ministering to the Lord. How could he not know the Lord? The spiritual situation in Israel was bad. We’re told that God’s word was rare and people didn’t have visions. God and God’s ways were but a distant memory. 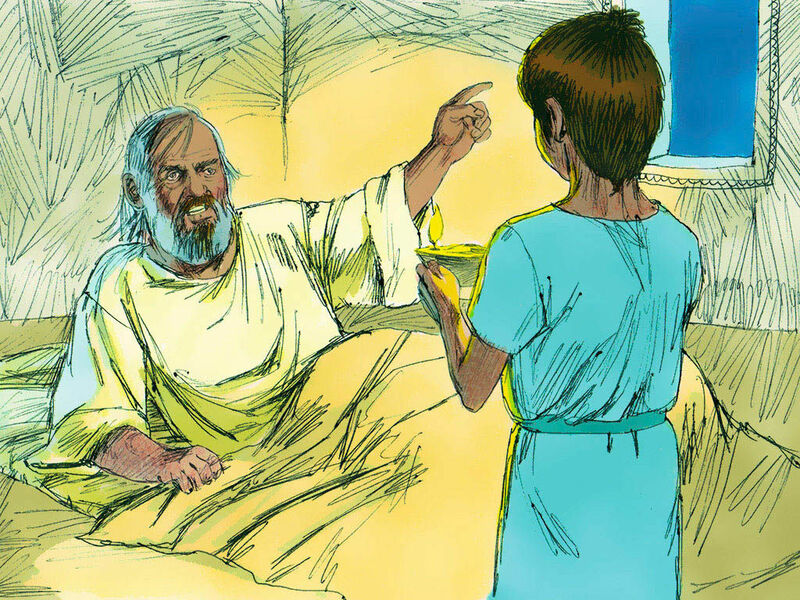 God called to Samuel, but Samuel did not recognize God’s voice. Samuel did not yet have an intimate relationship with God, so the voice was like that of a stranger. So assuming the voice was that of Eli, Samuel ran to his mentor, enthusiastically saying, “Here I am.” Samuel (and Eli) didn’t get it right, so God called out again and again. Three different times Samuel responded the same way: going to Eli and saying, “Here I am.” This is no calculated career move on Samuel’s part, but a vulnerable willingness to hear God’s message. Samuel’s call was intergenerational. Both Eli and Samuel are needed for God’s call to be heard and responded to. Samuel hears it, but Eli understands it. Eli mentored Samuel into identifying God’s voice. It may have taken Samuel running into Eli’s room three times in the middle of the night before the proverbial light went on for Eli. However, God’s persistence and Eli’s mentoring work hand in hand. When Samuel heard God’s voice a fourth time, he answered as Eli had directed him, “Speak, for your servant is listening” (v. 10). God revealed himself to Samuel and Samuel came to know God in an intimate way. Samuel had a long and influential career as a prophet and judge in Israel. God continued to appear to Samuel as he grew into a trustworthy prophet whose words always came true. Where visions and God’s word had been rare, they had now become frequent. We too, like Samuel, need open our hearts to say, “Here I am, use me.” Through a series of relationships, you have been nurtured in the faith into a place where you may hear God’s call and have a deeper relationship with God. Some of those people who have influenced our lives may have been: other family members, pastors, friends or Sunday School teachers. I’m sure Mrs. Goebel is one of those people who has faithfully shared God’s love and God’s word with you, Allie, Lucy and Alex. She has been an influence in the lives of many of us in numerous ways. We learn to understand and discern God’s voice and call to us from those who have gone before us. It is in the presence of others in the family of God that we can tell if what we think we’re hearing is really from God. Just as Samuel went to Eli, we can go to other people of faith. Who are the Elis in our lives? When it comes to call and discernment, our older members can help our younger members hear where God is calling them. And the younger members have the enthusiasm to fire up the older members. We can all encourage each other in the life of faith. Not many of us have experienced a call as dramatic as that of Samuel. However, God has called each of us to be disciples, followers of Jesus. I wonder…are we listening and hearing? You may have a sense of something you should be doing and wonder if that is God speaking. Just remember, you have a large Christian family willing to help you figure things out. How do we respond to God’s persistent nudging in our lives? Some people, like Jonah, pack up and run the other way. Others struggle for a long time to figure out just what God is calling them to do. Still, others seem to hear God’s call with absolute clarity. They immediately know what they are to do and set out to make it happen, and some of those folks have a hard time waiting for God’s timing. I will hold your people in my heart. Amen. John Rollefson, David W. Mc Creery, Bert Marshall, Feasting on the Word: Year B, Volume 3: Pentecost and Season after Pentecost.